Hannah Gage ’17 (United States/South Korea) accepted an offer with scholarship from The Ohio State University, where she will be a Pre-Medicine candidate. She declined an offer with scholarship from Wright State University and an offer from the University of Pittsburgh. The recipient of The Excellence in Science Award at her class’s Commencement Ceremony, Hannah earned a 6 on the demanding Biology HL and Chemistry HL exams en route to an impressive 37 total points on her IB Diploma assessment. Hannah was also very active outside the classroom during her three years at TASIS. Her excellent work as captain of the Varsity Basketball team and key contributor to the Varsity Cross Country team earned her the 2017 Female Athlete of the Year Award, and she also received The Jan Opsahl Service Award in 2017 for her dedication to the School’s Global Service Program—she traveled to Zambia and Botswana her junior year and was a student leader for the Understanding Ulgii (Teaching in Mongolia) group the following year—and the Cathy Clark Memorial Scholarship Award in 2016 in recognition of her exceptional dedication to community service. She also served as a Dorm Proctor for two years, participated in the TASIS Leadership Academy, and sang in the TASIS Choir. 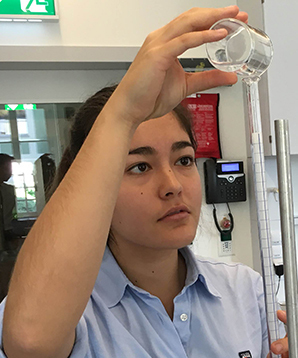 Among her many inspiring experiences at TASIS, Hannah described her time with the Leadership Academy, her proctorship, and her role on the basketball team as particularly memorable. She will fondly remember her basketball coach, Kent Hercules; her IB Biology teacher, Dr. Gillian Sawyer-Price; and the many other people who helped make her high school years unforgettable.